PARIS, France (CNN) — Drawings on the back of a Leonardo da Vinci painting may have been sketched by the Italian Renaissance artist, but only more tests by museum experts will tell. Experts from the Louvre are carrying out tests on the painting. 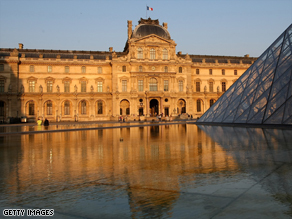 The Department of Paintings at the Louvre Museum in Paris and restoration and research experts from the Museums of France discovered the images this year on the back of the painting “The Virgin and Child with St. Anne,” the Louvre said in a news release Thursday. The style of the sketches resembles that of da Vinci, but the experts said closer examinations must be done to confirm they are his. After the art experts began studying the circa 1500 painting, an oil on wood, a conservator from the Paintings Department discovered two barely visible drawings on the back of it — a horse’s head and a partial skull. Closer scrutiny also revealed another sketch showing the infant Jesus with a lamb. The drawings, almost impossible to see with the human eye, were photographed with an infrared reflectographic camera, to reveal the underdrawings. The technique intensifies the degree of absorption of certain pigments, such as those that are carbon-based, which was the preferred material used for preparatory drawings during da Vinci’s era. According to the experts, drawings on the back of paintings is “extremely rare,” and none have been found so far that can be attributed to da Vinci.